Let's be honest - I have two small children and frankly finding time to paint my nails is tough. When I do manage it, inevitably something needs doing before my nails have dried properly and sure enough the polish smears or chips. I started painting them before I went to bed, only to wake up with the imprint of the duvet cover in my polish. Frustrating!! Then I read blogger's reviews about fast drying top coats. There was mention of one called Seche Vite (£9.95 for 14ml HERE). It sounded good, but expensive. But on the downside reviews also suggested it contained some undesirable chemicals and the bottle tended to go gloopy half way through. So I kept looking. 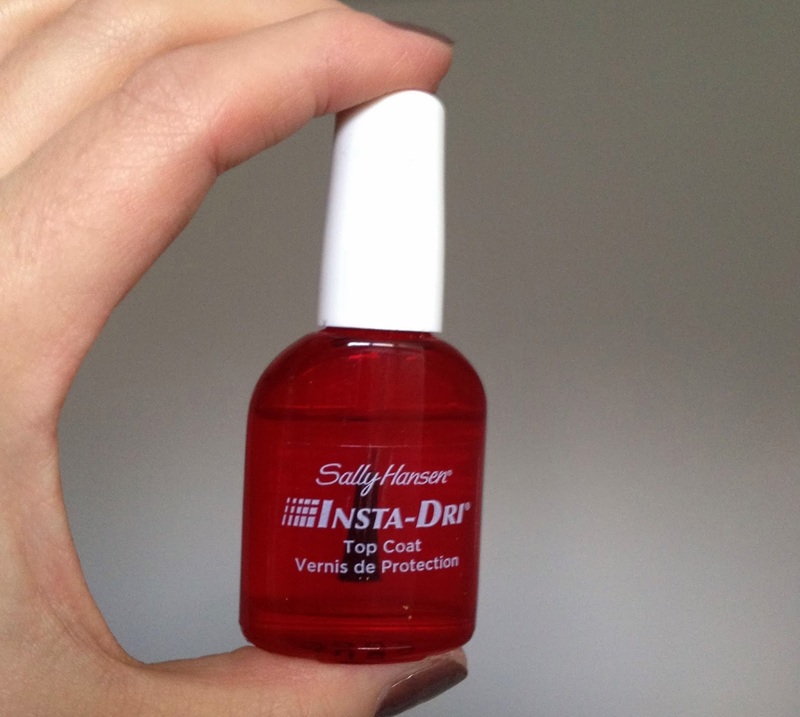 Then I came across Sally Hansen Insta Dri Top Coat (£5.05 for 13.3ml HERE). I'd never used a Sally Hansen product before (well except maybe nail polish remover) but I knew it was brand that was just about nails. Reviews were good, it was half the price of Seche Vite so I thought I would give it a go. 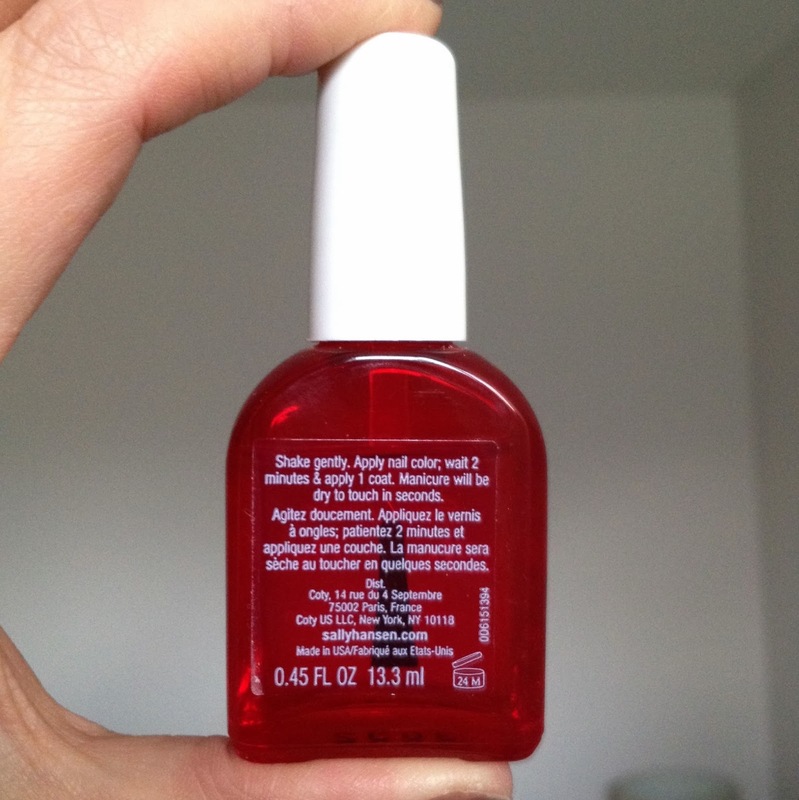 The formula is an acrylic polymer which dries the nail polish in 30 seconds. It has a UV filter and keeps colours true with no yellowing or fading. The top coat also gives a really good shine and smooth glossy finish to your nails, which I love! I'm no chemist so I don't know exactly how it works, but I recall reading somewhere that the formula soaks through the layers of polish and 'sets' them. It does what it claims and it is certainly impressive! You just apply your polish as normal and after your last coat wait 2 minutes and apply the Insta Dri Top Coat over the top. It is a thick clear formula which applies well and seems to level out by itself giving a good coverage. It really does set the nail in 30 seconds so you don't end up with dents or finger prints if you accidentally touch something. I would say that whilst it sets the top layer quickly the underneath layers take longer to dry. Don't go expecting to do manual work after 30 seconds with no repercussions - you can still slide the polish off of your nail if you aren't careful. Insta Dri has completey revolutionised my nail polish routine. Sadly it won't take care of my children for me whilst I pamper myself. But it means I can grab 10 minutes before I go to bed to paint my nails and not worry about imprinting the weave of my duvet into my nails. It also great for your toe nails - no more hours of cold winter feet waiting to put your socks back on, or sitting still so you don't scuff the polish as you rush around. I'm on my second bottle and I will admit the first bottle did get quite gloopy about half way through so I had to abandon it and buy another. But at half the price of Seche Vite I really didn't mind. If my time pressured nail painting sounds familiar or you are just impatient then Sally Hansen Insta Dri Top Coat is the one for you! I've found it at Feelunique HERE a little cheaper than it is in Boots. Have you tried Sally Hansen Insta Dri? How do you think it compares to Seche Vite? If you have any other tips for speedy nails then send them my way!! I've just picked up a bottle of Insta Dry Drops because apparently I'm too lazy ahem busy?! too even bother painting on a top coat, haven't used them yet but feeling hopeful after reading this! I tried Seche Vite but found it caused shrinkage and definitely went gloopy by halfway though, usually before!